To remedy a cat's tail-chewing, you have to know the cause. Several conditions can cause a cat to bite her own tail, including medical issues and parasites. While your cat will occasionally gnaw on her tail while grooming herself, frequently doing so isn't normal behavior. Excessive grooming can lead to hair loss and skin infections, so see the vet to determine the cause and treat it. It's no question, a cat who obsessively bites her tail needs a vet. One of the main causes of skin irritation in cats is skin parasites like fleas. Fleas may congregate near the base of your cat's tail, resulting in the skin there becoming itchy. The itchiness will cause your cat to chew at the area. Ringworm, a type of fungus, can also cause skin irritation, as can food allergies. Your vet can recommend an oral or topical medication to get rid of the fleas or fungi on or around her tail. He might also recommend food trials and a hypoallergenic diet if food allergies are to blame for her itchy skin. If your cat's tail becomes injured, she may bite at it in an attempt to relieve the pain. She may suffer from arthritis in the area she's biting, or may have an abscess there. Your vet can treat these conditions and administer pain medication to provide some relief from her symptoms. A medical condition known as feline hyperesthesia syndrome could cause your cat to bite her tail. This condition causes a cat's skin to become very sensitive. You may notice that she twitches, vocalizes or has muscle spasms just before she bites at her tail. Your vet may recommend putting your cat on anti-anxiety medications, anti-inflammatory medications or anti-seizure medications to help treat feline hyperesthsia syndrome. A cat who bites her tail may be dealing with stud tail, a condition that can affect both male and female cats but is most common in unneutered males. This condition, also known as supracaudal gland hyperplasia, occurs when the supracaudal gland produces an abnormally large amount of an oily substance called sebum. This gland is located at the base of the tail. Having a male cat neutered may help to resolve supracaudal gland hyperplasia. If the condition persists, your vet may recommend regularly washing the tail area with an antiseborrheic shampoo, which should help to reduce the irritation in this area and stop your kitty from chewing at it. A cat who becomes stressed or bored may start biting her tail. Some cats develop obsessive disorders and self-mutilate when they are anxious. To temporarily prevent your cat from biting at her tail and worsening any skin infections that she's caused, your vet may recommend that she wear an Elizabethan collar. If you notice that your kitty is biting her tail, distract her with a toy but don't punish her, as that may make her more anxious. Engage your cat in interactive play daily, feed her on a regular schedule, and provide plenty of toys for her to play with when you aren't home to keep her boredom and anxiety to a minimum. 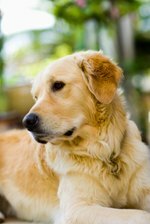 How Do I Treat My Golden Retriever's Dry Skin?